Raj & Pablo’s Bollytastic World: Mothers, Heaven, Reincarnation and Virgins! Raj&Pablo’s Bollytastic World: This week we have Baarish, Bollywood Hunks, Models and more! 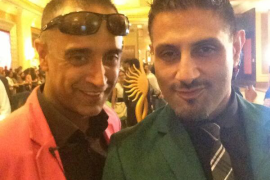 Raj&Pablo’s Bollytastic World: This Week John, Priyanka, Adnan and more! Calamari or Parrot Pie in a Dhadkan? Twists, Turns, A Fire and a Snake!